“They (the district and Bombay High Court judges) may be respectable members of the judiciary, but they cannot go un-controverted”, submitted Mr. Dave. 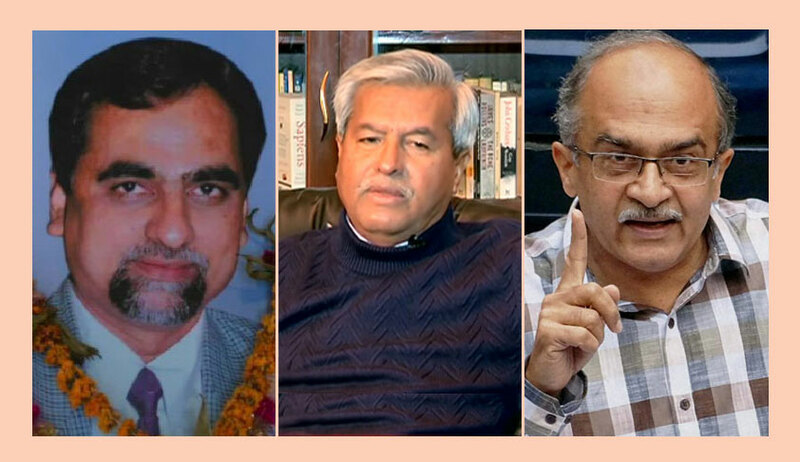 The Hearing of writ petitions seeking an independent probe into the death of CBI special judge Loya resumed before the Supreme Court bench of Chief Justice Dipak Misra, Justice D. Y. Chandrachud and Justice A. M. Khanwilkar on Thursday. Senior Counsel Dushyant Dave has again emphasized the need of cross examination of Judges, Commissioner and family members of Judge Loya. he has drawn the attention of the bench to Rules 1 and 2 of Order IX of the Supreme Court Rules of 2013. Repeating that the two Bombay High Court judges had said in the interview on November 27, 2017 exactly what the four judicial officers have written in their respective letters, he submitted that the cross-examination is necessary to extract the truth. On the importance of cross examination, he cited the Presidential Reference [(1997) 3 SCC 216]. “In the said case, government actions were struck down for the want of affidavits...in our situation, we have based our petitions on the article in the Caravan. In such cases, the cause and the facts and circumstances leading to the death are not easily discernible. We are relying on investigative journalism to press for an independent investigation”. Further, he mentioned the judgments in Kochuni v. State of Madras [(1959) Suppl. SCR 316] and Kathi Raning Rawat v. State of Saurashtra (1952) in the context of significance of affidavits. “They (the district and Bombay High Court judges) may be respectable members of the judiciary, but they cannot go uncontroverted”, submitted Mr. Dave. “If judge Loya died in unnatural circumstances, it is an attack on the independence of the judiciary. Please do not look at these petitions as adversarial as being viewed by the state of Maharashtra”, he remarked. Reiterating his earlier objection to the appearance of Senior Counsels Mukul Rohatgi and Harish Salve on behalf of the state of Maharashtra, he advanced, “if the Attorney General appeared on behalf of the state and took the same stance, I would have no objections. But these counsels have appeared for Amit Shah earlier”. Expressing displeasure at this, Mr. Rohatgi said, “We are only doing our duty”. Insisting on the need for an independent investigation, he Cited the judgment in Bandhua Mukti Morcha [(1984) 3 SCC 161] wherein, in context of the issue of bonded labour, it was observed, “even if the State Government is on its own inquiry satisfied that the workmen are not bonded and are not compelled to provide forced labour and are living and working in decent conditions with all the basic necessities of life provided to them, the State Government should not baulk an inquiry by the court when a complaint is brought by a citizen, but it should be anxious to satisfy the court and through the court the people of the country, that it is discharging its constitutional obligation fairly and adequately and the workmen are being ensured social and economic justice”. When Mr. Dave repeated the order dated February 23 of the apex court issued notice to the Delhi Police in the Sunanda Pushkar death case despite the maintainability of the PIL filed by Subramanian Swamy not having been established, Justice Khanwilkar retorted, “That case is different because therein the Delhi police was already required to submit the investigation report several days before the said order but it had failed to do so”. “In the absence of affidavits, how can I attack the veracity of the their letters on the grounds of contempt or perjury?”, Mr. Dave inquired. Thereupon, Mr. Dave cited the judgment in Chandra Shashi v. Anil Kumar Verma [(1995) 1 SCC 421], wherein it was observed, “Anyone who takes recourse to fraud, deflects the course of judicial proceedings; or if anything is done with oblique motive, the same interferes with the administration of justice...These prefatory remarks well project the importance of the point under consideration in this suo motu contempt action taken against respondent Anil Kumar for his having filed a fabricated document to oppose the prayer of his wife seeking transfer of a matrimonial proceeding from Delhi to Unnao...People would have faith in courts when they would find that (truth alone triumphs) is an achievable aim there; or (it is virtue which ends in victory) is not only inscribed in emblem but really happens in the portals of courts”. “Soon after the article in the Caravan was published, the Maharashtra government directed the Commissioner, State Intelligence, seated in Colaba, to conduct a discreet inquiry on November 23, 2017. On the very same day, the Commissioner addressed a letter to Chief Justice of the Bombay High Court, seeking permission to record the statements of the four judicial officers who he claimed had been traveling with judge Loya. How could he have known on that date that these judges had been accompanying judge Loya when the first time this information came in Public domain was on November 27, 2017, in the interview given to the Indian Express by Justices Gawai and Shukre? Further, the permission of the Chief Justice to ‘record the say’ of the said judicial officers was also conveyed to the Commissioner on November 23, 2017 itself! Also, the Commissioner addressed letters to the said judges which were delivered by hand on the very same day! Besides, to ‘record the say’ implies that the Commissioner was to operate in personem and not obtain letters from the district judges. “Interestingly, Dr. Prashant Rathi’s statement was recorded on November 22, 2017, even before the government had swung into action. This has been affirmed by the Superintendent of Police as well as Dr. Rathi himself”, he continued. “Judge Rathi’s letter is also dated November 23, 2017 and he was in Baramati. Letters of Judge Kulkarni, judge Modak, who was in Pune, and judge Barde, who was in Bombay, were received the following day. What was the hurry? Why did they write the letters without recollecting their thoughts or even asking for a copy of the Caravan article? Why did they not insist on receiving communication via the Registrar?”, inquired Mr. Dave. In reference to the letters, he remarked that it was strange that a judge addressed the Commissioner as “respected sir”. To this, Justice Chandrachud responded on a light note, “Maharashtra is a civilized place. Even the Collector regards the district judges as ‘respected sir’”. In respect of the alleged fact that upon judge Loya complaining of chest pain judge Barde had been called, Mr. Dave remarked, “Why did they not call ‘100’ so that the PCR could have arrived within seconds? They did not know where Barde was...it could have taken him as long as half an hour to arrive...he might not have had a car...he might not have known how to drive...besides, I have stayed at government guesthouses and there is always some car available at the premises”. Refuting the contention about the availability of a car, Justice Chandrachud said, “I am a Supreme Court judge and I had to wait for my driver to take me to the hospital in the middle of the night”. In the course of the hearing on Thursday, Mr. Dave said that he is troubled by the fact that the bench offered questions to each of his arguments and not to Mr. Rohatgi’s. To this, Justice Chandrachud retorted that it is solely the judges’ discretion as to who they pose a question to and when. Moving on to the statements of the father and sisters of judge Loya, he submitted that the declarations that they have no suspicion with regard to the death have been procured under coercion. Referring to the video recordings of the interviews conducted by journalist Niranjan Takle, he submitted, “Earlier the father had said that his son had been killed and that they wanted an inquiry. He had said that judge Loya was offered a bribe of Rs. 100 crores and even land in Bombay. The father had stated that judge Loya was in a lot of tension”. Mr. Dave repeated that in the course of the interviews, Dr. Beyani had admitted, “When we received the body, my brother’s glasses were below his neck, there were blood stains on the back of his neck, the buckle on his belt was on the wrong side, his face was swollen and the jaw twisted”. “Your Lordships had said at the previous hearing that an investigation shall be ordered if there is the slightest suspicion. Black’s Law dictionary defines ‘suspicion’ as the sense of something wrong based on ‘inconclusive or slight evidence or even no evidence’. Oxford dictionary relates ‘suspicion’ to ‘questionable character or condition’”, submitted Mr. Dave, pressing his prayer for an independent investigation monitored by a retired Supreme Court Chief Justice. “the apex court had assigned the investigation (in the Sohrabuddin murder) to the CBI and directed the trial to be transferred outside of Gujarat.There was the force dictum that the trial shall be conducted by a single judge from start to finish. Despite that, judge Utpat was transferred and judge Loya was inducted, who mandated the presence of the accused. The hearing had been adjourned to December 15, 2014, but judge Loya died on December 1, 2014. Thereupon, Advocate Prashant Bhushan commenced his arguments on behalf of the CPIL. “Although the postmortem report is annexed to the discreet inquiry report, there is no report of the ECG which was allegedly carried out at the Dande Hospital. The doctor at Dande had stated that ‘Tall T waves’ had appeared in the ECG which is indicative of heart attack and this contention was affirmed by the Meditrina Hospital. The said ECG report was published by the Indian Express. Several cardiologists have confirmed that the said ECG could not have been of an individual who had suffered a heart attack an hour or two back. Renowned cardiologist Dr. Upendra Kaul, who is also a Padma Shri awardee, has reiterated that observation in his written opinion. The ECG was dated November 30, 2014, in respect of which Dande offered explanations, and was timed at 5:11 AM...who has fabricated the ECG report?”, he submitted. “The other report that has not been brought on record is of the histopathology examination. The histopathology report has revealed narrowing of arteries and congestion in the brain, but the heart tissue and muscles have shown to be normal. When there is a heart attack, one part of the heart dies and that would have been apparent in the microscopic exam...I have filed my own affidavit in this behalf as I had spoken to the doctors in person who were not willing to come on record”, he continued. The hearing shall resume on Friday.